The Porsche 928 was a sports-GT car sold by Porsche AG of Germany from 1978 to 1995. Originally intended to replace the company’s iconic Porsche 911, the Porsche 928 attempted to combine the power, poise, and handling of a sports car with the refinement, comfort, and equipment of a luxury sedan to create what some Porsche executives thought would be a vehicle with wider appeal than the compact, quirky and sometimes difficult Porsche 911. Since its inception in 1949, Porsche has manufactured only six front-engined models, four of which were coupes, including the Porsche 928. The car has the distinction of being the company’s only coupe powered by a front-mounted V8 engine, and the company’s first mass-produced V8 powered model. By the late 1960s, Porsche had changed significantly as a company, and executives including owner Ferdinand Porsche were playing with the idea of adding a luxury touring car to the line-up. Managing Director Ernst Fuhrmann was also pressuring Ferdinand to approve development of the new model in light of concerns that the current flagship model at the time, the Porsche 911, was quickly reaching its maximum potential where it could soon no longer be improved upon. Slumping sales of the Porsche 911 seemed to confirm that the model was approaching the end of its economic life cycle. Fuhrmann envisioned the new range-topping model as being the best possible combination of a sports coupe and a luxury sedan, something well equipped and comfortable enough to be easily driven over long distances that also had the power, poise and handling prowess necessary to be driven like a sports car. This set it apart from the Porsche 911, which was a pure sports car. The finished Porsche 928 debuted at the 1977 Geneva Motor Show before going on sale later that year as a 1978 model. Although it won early acclaim for its comfort and power, sales were slow. Base prices were much higher than that of the previous rangetopping Porsche 911 model and the Porsche 928’s front-engined, water-cooled design put off many Porsche purists. The Porsche 928 featured a large, front-mounted and water-cooled V8 engine driving the rear wheels. Originally displacing 4.5 L and featuring a single overhead camshaft design, it produced 219 hp (163 kW/222 PS) for the North American market and 237 hp (176 kW/240 PS) in other markets. Porsche utilized a transaxle in the Porsche 928 to help achieve 50/50 front/rear weight distribution, aiding the car’s balance. Although it weighed more than the difficult-to-handle Porsche 911, its more neutral weight balance and higher power output gave it similar performance on the track. 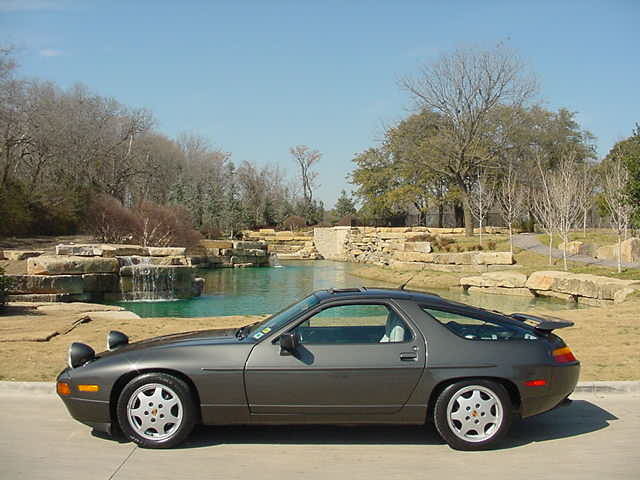 The 928 was regarded as the more relaxing car to drive at the time. The body, styled by Wolfgang Möbius under guidance of Anatole Lapine, was mainly galvanized steel, but the doors, front fenders, and hood were aluminum in order to make the car more lightweight. It had a substantial luggage area accessed via a large hatchback. The new polyurethane elastic bumpers were integrated into the nose and tail and covered in body-coloured plastic; an unusual feature for the time that aided the car visually and reduced its drag. 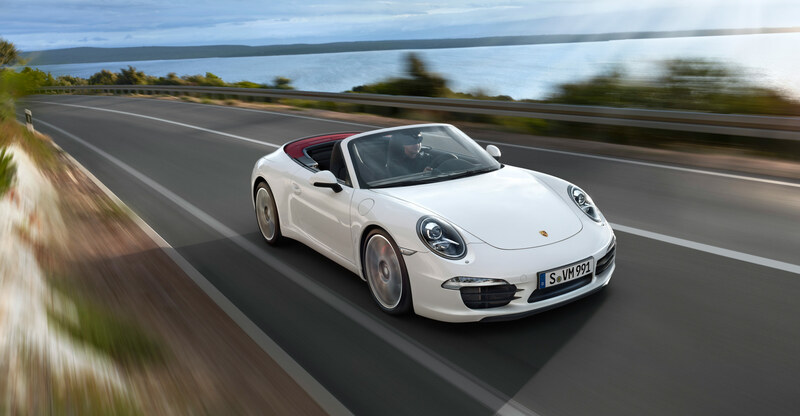 Porsche opted not to offer a convertible variant but some aftermarket modifiers offer convertible conversions. The Porsche 928 qualified as a 2+2, having two small seats in the rear. The Porsche 928 was also the first vehicle in which the instrument cluster moved along with the adjustable steering wheel in order to maintain maximum instrument visibility. The Porsche 928 was also the first vehicle in which the instrument cluster moved along with the adjustable steering wheel in order to maintain maximum instrument visibility. 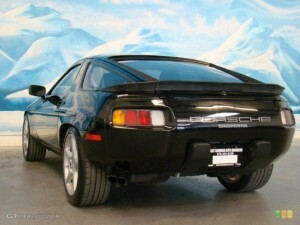 The Porsche 928 included several other innovations such as the “Weissach Axle”, a simple rear-wheel steering system that provides passive rear-wheel steering while cornering, and an unsleeved, silicon alloy engine block made of aluminum, which reduced weight and provided a highly durable cylinder bore. Porsche’s design and development efforts paid off during the 1978 European Car of the Year competition where the 928 won ahead of the BMW 7-series and the Ford Granada. The Porsche 928 is the only sports car so far to have won this competition, where the usual winners are mainstream hatchbacks and sedans/saloons from major European manufacturers. This is regarded as proof of how advanced the 928 was compared to its contemporaries. Porsche introduced a refreshed Porsche 928 S into the European market in 1979 model year, although it was summer of 1982 and MY 1983 before the model reached North America. Externally, the S wore new front and rear spoilers and sported wider wheels and tires than the older variant, but the main change for the Porsche 928 S was under the hood, where a revised 4.7 L engine was used. European versions debuted with 300 PS (221 kW/297 hp), and were upgraded to 310 PS (228 kW/306 hp) for 1984 model year, though it is rumored [and proven on chassis dynamometers] that they typically made around 330 hp. From 1984 to 1986, the ROW (Rest of World) S model was called S2 in UK. Porsche updated the North American 928 S for 1985, replacing the 4.7 L SOHC engine with a new 5.0 L DOHC unit sporting four valves per cylinder and producing 288 hp (215 kW/292 PS). Seats were also updated to a new style. These cars are sometimes unofficially called S3 to distinguish them from 16-valve ROW “S” models. 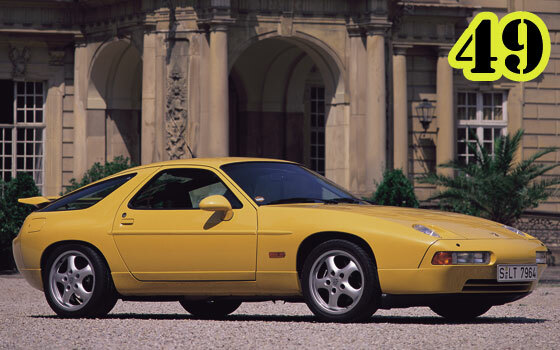 A Porsche 928 Club Sport variant which was up to 100 kg (220 lb) lighter became available to continental Europe and U.S. in 1988. This model was watered down version of 1987 factory prototype which had lightened body. Also in 1987 the factory made four white lightened manual gearbox S4 models for race car drivers who were on their payroll at the time. These were close to same as later actual Club Sport models and can also be considered prototypes for it. An SE (sometimes called the S4 Sport due to model designation on rear bumper), a sort of halfway point between a normally equipped S4 and the more race-oriented Club Sport, became available to the UK. Porsche debuted the Porsche 928 GT in the late winter 1988/89 after dropping the slowly selling CS and SE. In terms of equipment, the GT was like the 928 SE, having more equipment than a Club Sport model but less than a Porsche 928 S4 to keep the weight down somewhat. The S4 and GT variants were both cut at the end of 1991 model year, making way for the final version of the 928. The Porsche 928 GTS came for sale in late 1991 as a 1992 model in Europe and in spring of 1992 as an early 1993 model in North America. Changed bodywork, larger front brakes and a new, more powerful 5.4 L, 350 PS (257 kW/345 hp) engine were the big advertised changes; what Porsche wasn’t advertising was the price. Loaded Porsche 928 GTS models could eclipse $100,000 USD in 1995, making them among the most expensive cars on the road at the time. This severely hampered sales despite the model’s high competency and long standard equipment list. Porsche discontinued the Porsche 928 GTS model that year after shipping only 77 of them to the United States. Styling was the same from 1978 through 1979 and the body lacked both front and rear spoilers. From 1980 (1983 in North America) through 1986, front and rear spoilers were present on “S” models, rear spoilers were integrated into the hatch. From 1987 through 1995, the front spoiler is integrated into the nose and the rear spoiler became a separated wing rather than an integrated piece, and side skirts were added. The rear tail-light configuration was also different from previous versions. 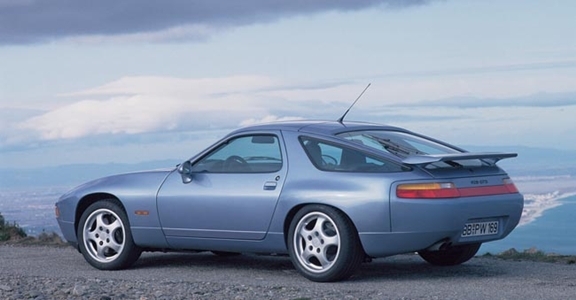 Porsche 928 GTS model had wider rear fenders added to give more room for 9″ wide wheels. Another easily noticeable visual difference between versions is the style of the rims. Early 928s had 15″ or 16″ “phone dial”-style rims, while most 1980s 928s had 16″ slotted “flat discs”, CSs, SEs and 1989 GTs had 16″ “Club Sport”, later GTs had 16″ “Design 90″ style which were also option on same period S4s, the GTS used two variations of the 17” “CUP” rims. In 1982 model year, two special models were available for different markets. 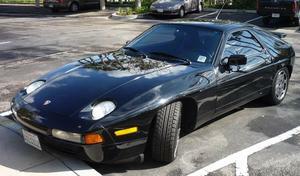 205 “Porsche 928 Weissach Edition” cars were sold in North America. Unusual features were champagne gold metallic paint, matching brushed gold flat disc wheels, two-tone leather interior, a plaque containing the production number on the dash and the extremely collectible three-piece Porsche luggage set. 140 special “Porsche 928 50th Jubilee” 928 S models were available outside the U.S. and Canada to celebrate the company’s 50 year existence as a car manufacturer. This model is also sometimes referred to as the “Ferry Porsche Edition” because his signature was embroidered into the front seats. It was painted meteor metallic and fitted with flat disc wheels, wine red leather and special striped fabric seat centers.